Democrat and Chronicle "My copy already has creases in the cover and plenty of dog-eared pages. There are more than 300 activities outlined in the guide (maps, photos and GPS coordinates will get you there), and best of all none take up an entire day. Chase's book really is for anyone looking to make the most of their time in the Adirondacks. Throw it in your glove compartment and have the kids read it on the drive up." Adirondack Life: "For your own cuties there’s Adirondack Family Time: Tri-Lakes & High Peaks Regions (Hungry Bear Publishing, 2011), by Adirondack Daily Enterprise columnist Diane Chase. 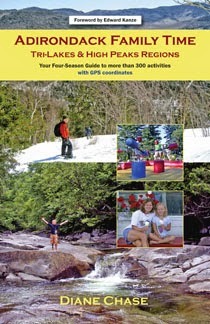 It’s a user-friendly guide with detailed descriptions of mini-hikes, ski trips, historic forays and more, organized by location, season and age group. Chase also offers helpful safety tips, bug-battling strategies and rainy-day bore­dom busters"
Press Republican "This book provides ideas for Adirondack-style family fun. Section One The Triple Gems," is an overview of the Tri-Lakes region. Chapter one, two and three give tips on what to do in Lake Plaid, Saranac Lake and Tupper Lake. Chapter four covers the High Peaks region — Jay, Upper Jay, Wilmington, Keene and Keene Valley. Each chapter includes a map, trivia, mini-hikes and walks, and attractions indoors and outdoors." Adirondack Explorer: "A compendium of family fun... for a parent trying mightily to cure cabin fever or just looking for a break out of the routine, Chase's book will feel like an encyclopedic reference. Nothing to do? No more." Adirondack Almanack: "Chase's first Adirondack Family Time, is a great guide for exploring the Adirondacks with kids in tow. Handy maps and GPS coordinates are combined with insider tips, pricing, and age appropriate ratings for places and activities. The opportunities here have been carefully selected to hold the interest of kids and this guide is written with a real knowledge of what kids (and adults) want out of their nature experiences. No doubt this is one book that's sure to be passed from parent to parent."